The volume comes from intensive researches on the connection between music and memory that have been taking place for over 5 years at the LEPE (Laboratory of Epistemologies and Educational Practices), Department of Humanities, University of Naples ?Federico II?. International academics partners have collaborated to its realization. The contributions included present an interdisciplinary approach, between neurosciences, psychology and pedagogy, and are the result of scientific research conducted in the last year and not yet been published. 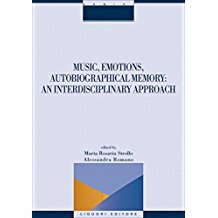 Innovatively, for the first time the connection between music, emotions and memory is explored in all its complexity in an interdisciplinary and intercultural approach, with the support of empirical results of accredited scientific research.